Pharaoh is worried! His tomb at Giza is behind schedule and he fears it will not be done in time for his funeral. He is offering great rewards to the faction that contributes the most work on his pyramid in the next 10 years. If your people work the hardest and work the smartest you shall earn Pharaoh’s favor! 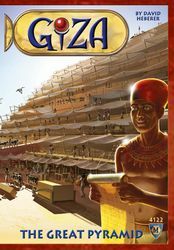 In Giza - the Great Pyramid, you are the leader of one of four factions vying for Pharaoh’s favor. You have 10 years to outperform the other factions and contribute the most to his great pyramid, earning eternal gratitude and glory. You shall need to balance your labor! Farm and fish to feed your people. Sweat and struggle with the back-breaking labor of moving the giant stone blocks into place. Task your folk with the creation of exquisite artworks to beautify Pharaoh’s eternal rest. Are you smart enough, organized enough and diligent enough to lead your people and earn Pharaoh’s favor?